The Mad Hatter and the Queen of Hearts are just two of the exciting roles up for grabs when a pantomime version of children’s favourite, Alice in Wonderland, is cast. The Queens Parks Arts Centre is holding auditions throughout June for the community panto, which will be performed at the Limelight Theatre in December. The script has been written by theatre manager Dario Knight, who penned last year’s Beauty and the Beast, and he is also the production manager for the show. He said: “It’s been a fun challenge taking the original stories and turning them into a pantomime. The characters fit the medium brilliantly but the episodic structure of the books is trickier to adapt -nobody wants to wait until after the interval to meet the Mad Hatter and the Queen of Hearts! Actors aged 17 and above are invited to try out for roles at the open auditions. These are being held at 11am on Sunday June 5, 7pm on Thursday June 16 and 11am on Sunday June 19. Audtionees need attend only one sessions and actors of all levels of experience are invited to take part. Running throughout December the show will feature not only a cast of local actors, but sets, costumes and props designed and produced by the arts centre’s creative team of artists and makers. Students of the Susan Diane School of Dance will again join the production, following acclaimed appearances in the last three shows. 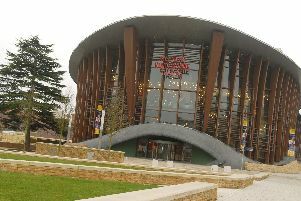 Since returning in 2011 the Queens Park pantomime has become a highly popular festive fixture in Aylesbury Vale.Last year’s show broke all box office records for the venue, with over 1,800 people seeing the production at the Limelight Theatre. Local actor, writer, director and filmmaker David Pustansky is directing the pantomime, having starred as Percy in Beauty and the Beast last year. David trained professionally as an actor at Drama Studio London and also as part of the BBC Talent Boost training programme with the Actors Centre in London. He regularly writes, directs and stars in the highly popular walking plays that take place in Aylesbury town centre every autumn. Tickets for the pantomime, which runs from Friday December 9 through to Saturday December 31 are on sale now at www.qpc.org or call 01296 424332. The picture above shows director David Pustansky and writer Dario Knight.